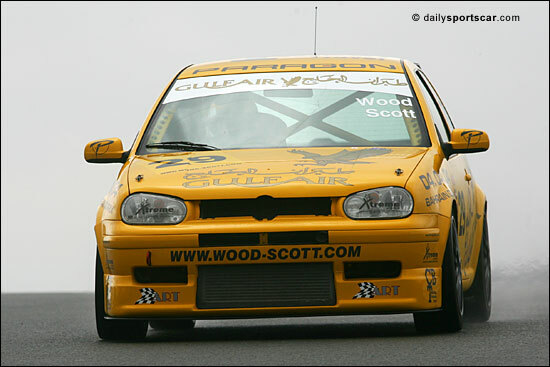 With the Wood-Scott Jaguar V8Star already shaken down and tested, Wood-Scott Racing opted to bring an old friend out to play at the Britcar Media day last Friday (March 24). 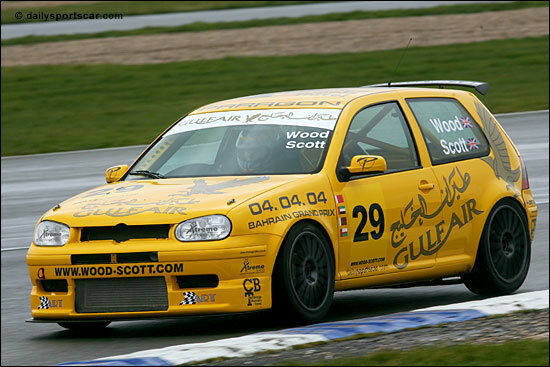 The crowd pleasing, ex-British GT Cup Class, VW Golf GTI Turbo was lapping quickly, in the hands of both Steve Wood and Stuart Scott. That comes after Eurotech had sorted out the gearbox woes that prevented the Golf from achieving its full potential in the British GT Championship. It was outlawed for 2004 because of its front wheel drive. The Golf ran the first test session with the Britcar runners and lapped quicker than the Damax Ferrari 360, whilst in the second session the car ran again, alongside the Production S1 runners, and set a best lap time of 1.34 compared to Saturday’s pole time of 1.42 (admittedly in the wet)!! It leaves the two drivers with a tricky choice as the new V8 Challenge is effectively going to give the opening Britcar round at Oulton Park a miss. “What do we do now? 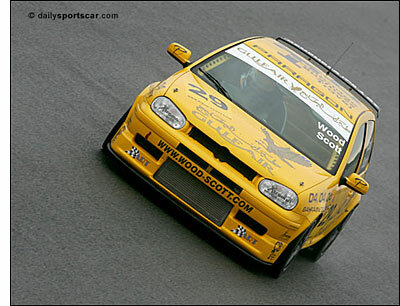 Run the Golf in Britcar or Production at Oulton and wait till Snetterton for the V8 Challenge? “It was great to have the Golf out again and everyone who came over to see us (or rather the car) had a smile on their faces,” said the equally smiley S. Scott. It looks possible then that the Golf might just be out and battling at Oulton Park before the racing debut of the Eurotech-run Jaguar at Snetterton. EERC Supremo James Tucker explains that “with a lot of the V8 cars being new machines, and some of them not finished, we’re going to run the V8 cars in 2006 as part of the Britcar races – effectively as test races for 2007, so that we can test air restrictors and the like.